Today is Wednesday, February 22, the 53rd day of 2017 in the Gregorian calendar, with 312 days remaining. 1,428 days until the end of Donald Trump's term as President, assuming he isn't impeached. 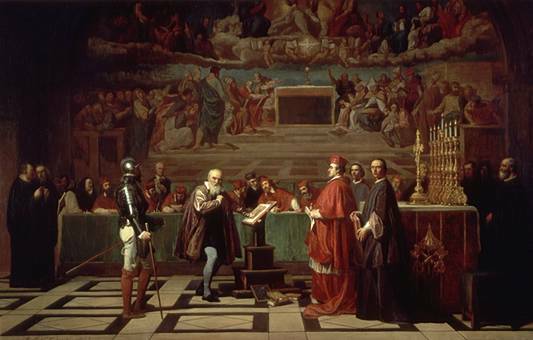 Galileo before the Holy Office, a 19th-century painting by Joseph-Nicolas Robert-Fleury. On this day in 1632, Galileo's Dialogue Concerning the Two Chief World Systems was published, in which he championed the Copernican sun-centric solar system theory over the earth-centered Ptolemaic system. In 1633, Galileo was found to be "vehemently suspect of heresy" based on the book, which was then placed on the Index of Forbidden Books, from which it was not removed until 1835 (after the theories it discussed had been permitted in print in 1822). In an action that was not announced at the time, the publication of anything else he had written or ever might write was also banned in Catholic countries. In November, 1992, 359 years later, at a ceremony in Rome before the Pontifical Academy of Sciences, Pope John Paul II officially declared that Galileo was right. The formal rehabilitation was based on the findings of a committee of the Academy the Pope set up in 1979, soon after taking office. The committee decided the Inquisition had acted in good faith, but was wrong. Among other things, today is also National Margarita Day. Florida man savagely grades ex-girlfriend's apology letter. "I hope for an America where we can all contend freely and vigorously, but where we will treasure and guard those standards of civility which alone make this nation safe for both democracy and diversity." No, your cat isn't a threat to your mental health. At least parasites from its litter box aren't. West Wing creator Aaron Sorkin on Donald Trump... "I believe that Donald Trump in addition to everything else is a constitutional crisis waiting to happen..."
He also spoke out at the Writers' Guild awards. The example of Easter Island shows why humanity will be extinct within 100 years. Too many people, too few resources. Plus a bonus video about the sixth great mass extinction event, in which we all have front row seats. What Happens If You Stick Your Head in a Particle Accelerator? No, you don't become a Marvel superhero. Terrorists are building drones. France is destroying them with eagles. Under French military supervision, four golden eagle chicks hatched last year atop drones — born into a world of terror and machines they would be bred to destroy. "It turns out that the year 2000 marks a grim historical milestone of sorts for our nation. For whatever reasons, the Great American Escalator, which had lifted successive generations of Americans to ever higher standards of living and levels of social well-being, broke down around then—and broke down very badly.